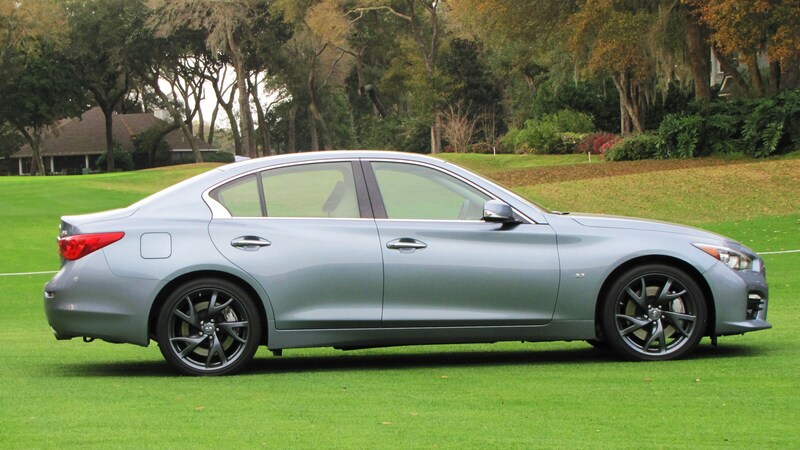 The trip to Florida for the Amelia Island Concours, auctions and other fun times was pretty great, and was enhanced by the cool car I drove during my stay: a 2015 Infiniti Q50S sports sedan. 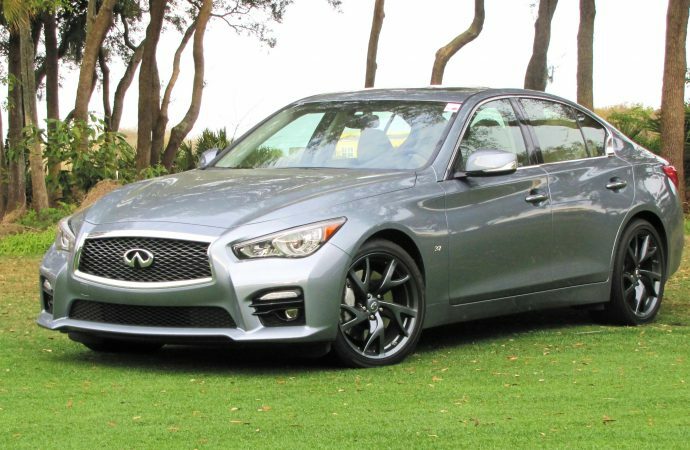 The trip to Florida for the Amelia Island Concours, auctions and other fun times was pretty great, and was enhanced by the cool car I drove during my stay: a 2015 Infiniti Q50S sports sedan. There was lots of driving during this trip, some of it on interesting roads, and the Q50S lived up to the accolades that have been heaped on it by the public and press since its arrival last year. The luxury compact sedan is quick and agile. Its sculpted lines and aggressive stance prompted quite a few admiring comments, including those from classic car people who had rolled in for the world-class events. That says a lot when you’re surrounded not only by great classics but all the pricey luxury sedans and exotic sports cars gleaming in the parking lots. 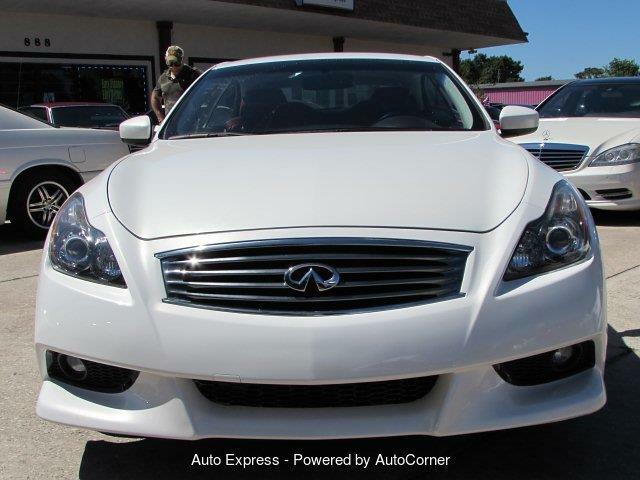 The all-new Infiniti Q50 arrived for 2014 at the same time Nissan’s luxury division created its new Q-based naming system. 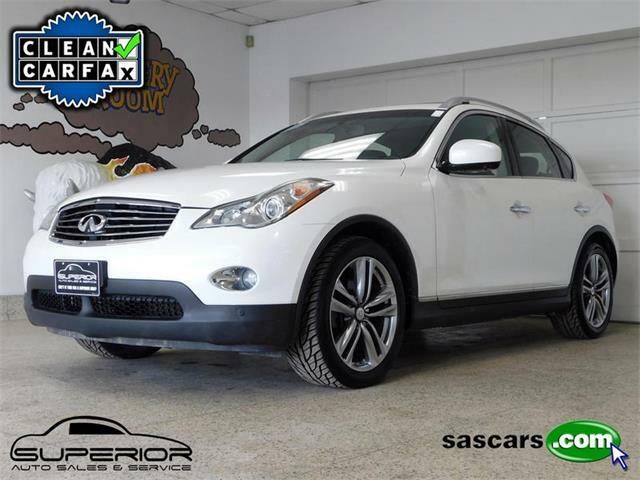 This model slots between the Q40 (the former G37 sedan, which also is the basis for Q50) and the Q60 (the former G37 coupe and convertible). Not an easy nomenclature to master. I liked it better when cars had descriptive names, like Thunderbird or Barracuda. 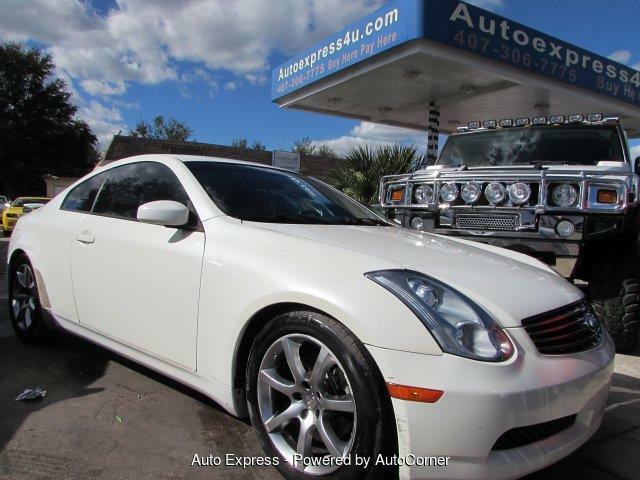 Or Nissan Maxima, for that matter. According to Infiniti’s figures, the Q50 was by far the brand’s top-selling nameplate during 2014 and for the first three months of 2015. So you could say it’s been a rousing success. The Q50 carries on for 2015 with a few updates, such as a new Performance Wheel Package option, with 19-inch RAYS super light forged-aluminum-alloy wheels and slim-profile tires. The test Q50S was so equipped – the unique wheels look awesome and the tires have lots of grip. Ten different variations of the sedan are offered, including various combinations of premium, sports, all-wheel-drive and hybrid models. 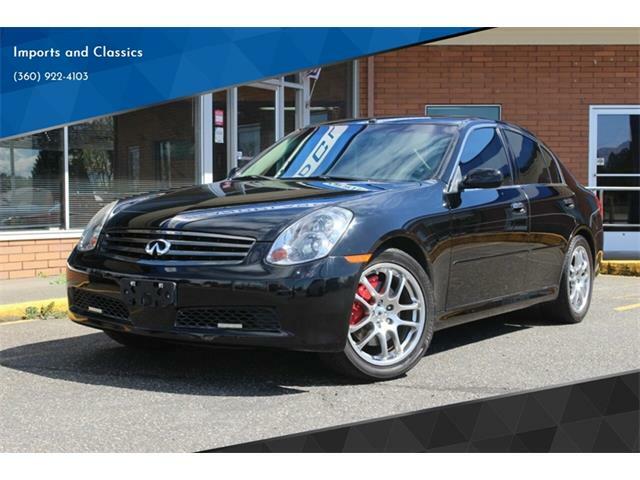 The Q50S that I drove was the all-out sports model with rear-wheel drive; it also is available with AWD. The Q50S might not be on the radars of driving enthusiasts who are shopping more-familiar compact performance sedans from BMW, Audi, Mercedes-Benz, Lexus or Cadillac, but the Infiniti sport model’s blend of sharp-edged handling and exuberant drivability sets it apart and would be worth considering in this price range of around $50,000. 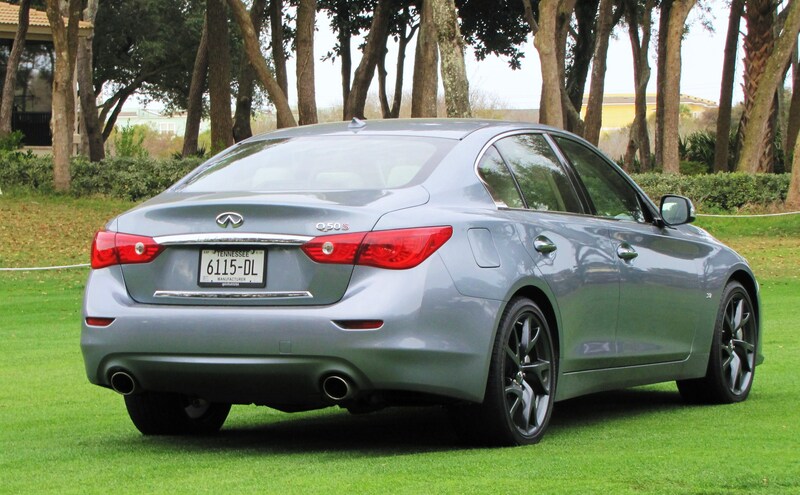 The Q50 has taken some knocks from critics as being unrefined. With its firm suspension and low-profile tires, the S model I drove delivered a sometimes harsh ride accompanied by a thrum of road roar. But that’s all in the game when one chooses the most-aggressive package. I thought it was right on the money. The steering could use a bit of dialing back, however. While highly responsive, the wheel requires a good deal of attention for staying on track, especially during high-speed highway runs when it feels too light and overly twitchy. I found myself strengthening my grip on the rim when the attitude should have been more relaxed on the open road. 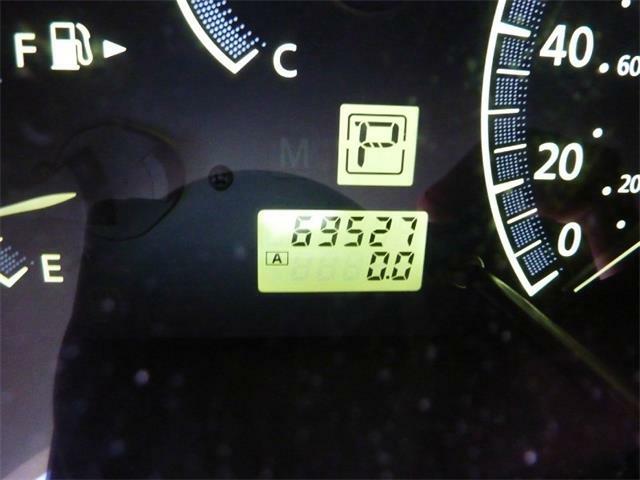 There is an optional power-steering system, called Direct Adaptive Steering, which I understand is better controlled. 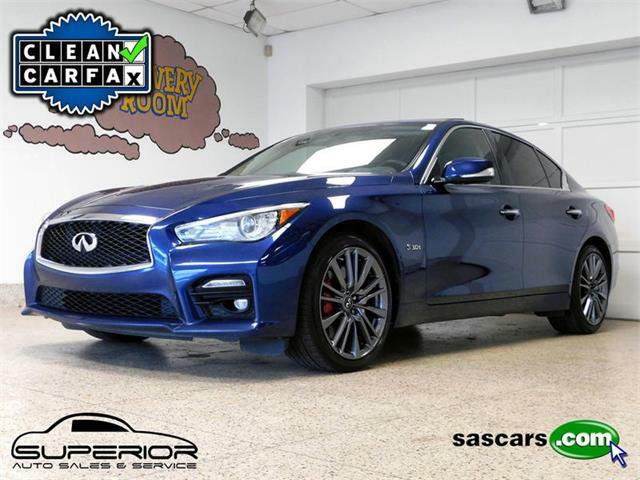 All Q50 models are powered by the familiar and enjoyable Infiniti/Nissan 3.7-liter V6 which delivers 385 horsepower at a lofty 7,000 rpm and 269 pound-feet of torque at 5,200 rpm in this application. The power is strong, though it would seem that a higher-output engine should be available to compete with the top performance versions of competing sports sedans. 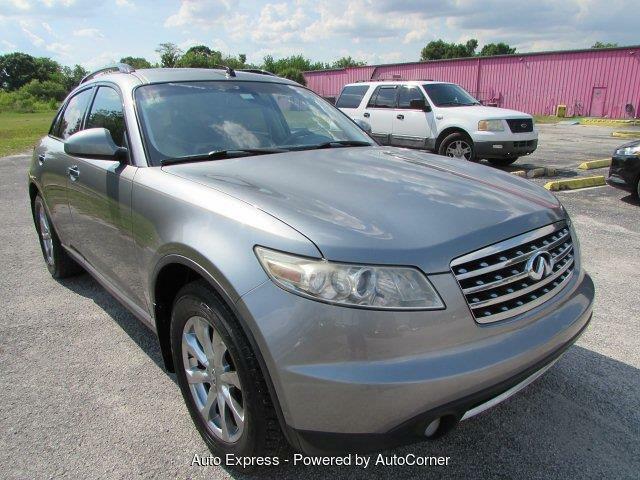 The V6 generally feels smooth and non-intrusive, though it can get fairly raucous under hard acceleration. 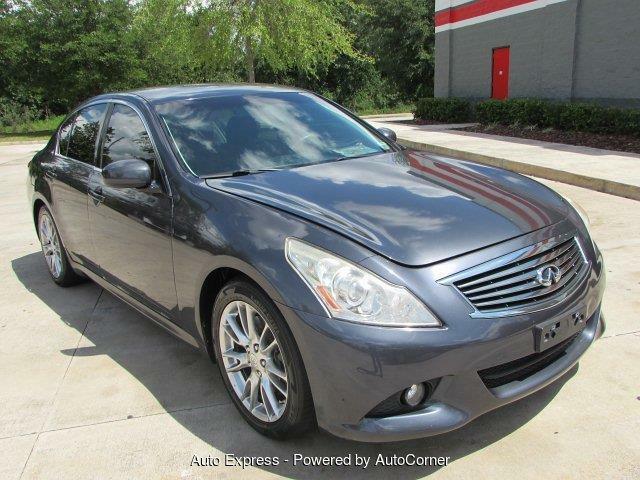 Not a problem here, though buyers of the more-sedate Q50 versions might find it, well, unrefined. 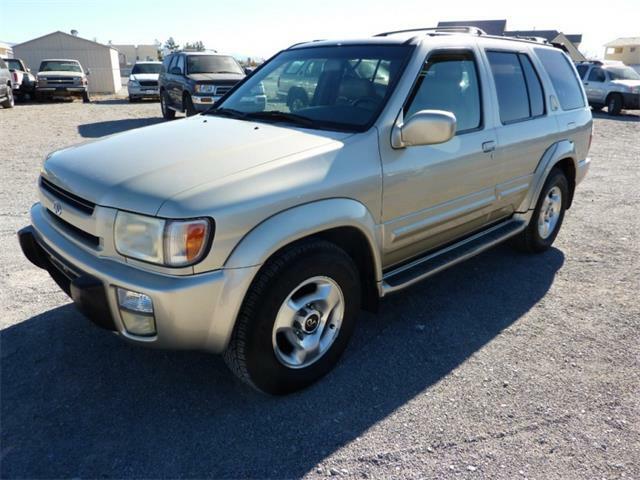 The seven-speed automatic transmission does a decent job at sorting things out and was essentially unnoticeable throughout its range of activities. Manual shifting can be accomplished via a pair of magnesium shift paddles that are firmly attached to the steering column, the much-preferred setup instead of swinging around with the wheel. Responses to driver inputs are quick and precise, and downshifts are smoothed by rev-matching technology. A nice package. Infiniti has dumped the manual-transmission option for the Q50 since, the automaker claims, so few people ordered it. That’s a sad commentary, in my opinion, since we dinosaurs still like to shift sports cars for ourselves. I recently drove a manually shifted Q60S, which was much more engaging. The interior appears fresh, modern and simple, despite the load of gadgets and controls. I was thankful for a clear-eyed navigation system while I was a stranger in paradise, although some of the input operation seemed complex. Same with the audio system, which depends too much on poking the touch screen for switching stations and such. Knobs are always appreciated. 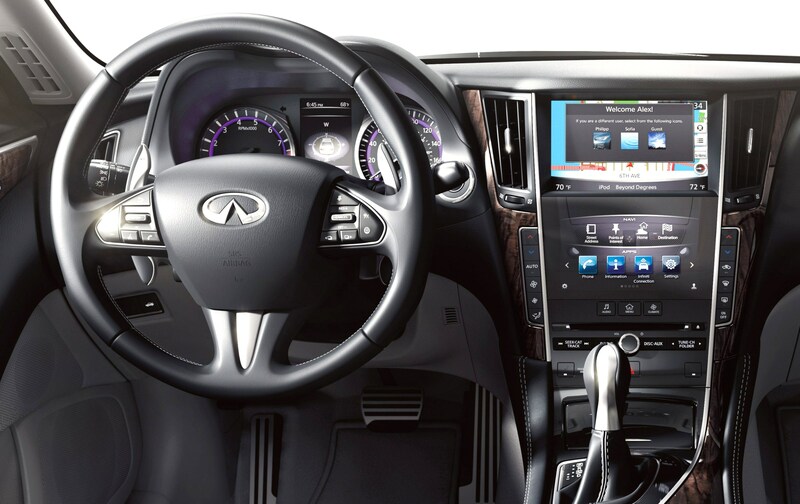 The test car featured Infiniti’s InTouch Dual Display System, which includes two large touch screens snuggled into the console, the top one handling navigation and vehicle information and the lower one showing audio, climate control and the various apps. Seemed a bit over the top at first, but I quickly appreciated its value. The system comes with full connectivity and “intelligent keys” for storing information. 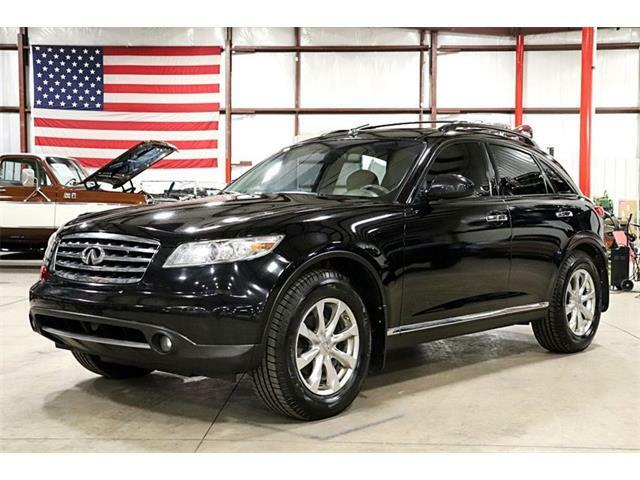 The InTouch Navigation Package, a $1,400 option, added a number of functions, such as voice recognition, Sirius XM Traffic and Infiniti Connection, with automatic collision notification, destination assistance and drive-zone monitoring. The Q50S comes standard with a boatload of safety, convenience and drivability systems, including an excellent Infiniti Studio on Wheels premium audio system with 14 Bose speakers, power moonroof, push-button start and entry (I do like leaving the key in my pocket) and Bluetooth. 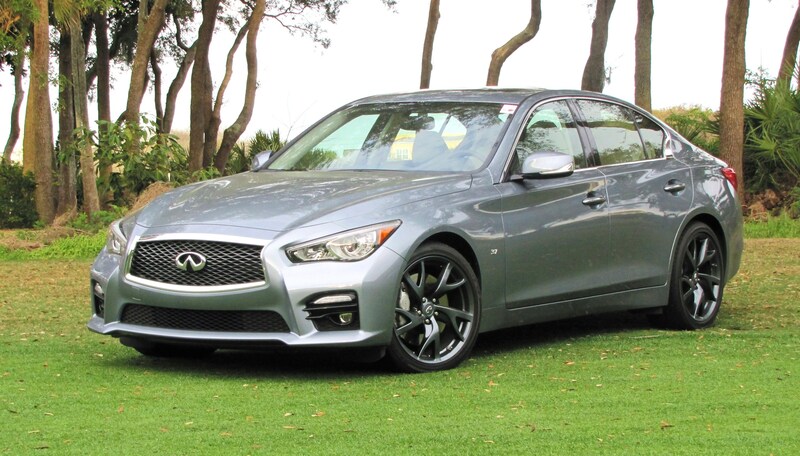 Starting with the base price of $43,650, the Q50S had the Navigation option and the $1,800 Performance Wheel Package, plus $95 shipping, for a bottom line of $47,755 which seems about in line for the high level of equipment, style and performance.